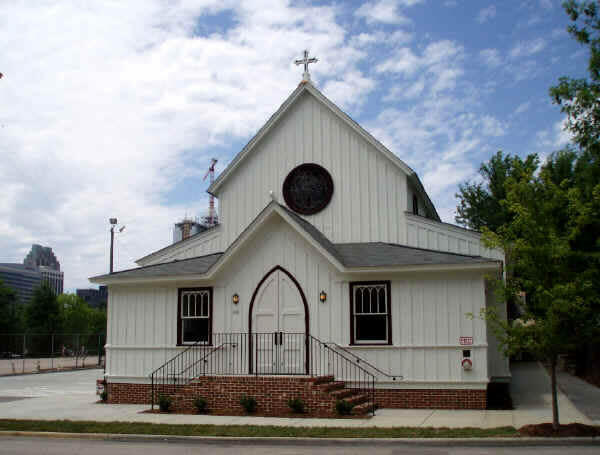 Built in 1875, All Saints Chapel has been an integral part of downtown Raleigh's charm for over a century. Its details have been perfectly restored, and the open floor plan of the Chapel and Reception Hall make customizing your meeting or special event easy. The chapel's capacity ranges from 140 people in the banquet or classroom style to 260 in reception style. The reception hall accommodates 160 to 250 guests. The house sound system and prep-kitchen for catered events provide the necessaries for your event, while the beautiful stained-glass windows and classic woodwork provide a stunning backdrop.